The Frugal Flambe | Penny pinching solutions for hungry families. Let’s face it. When it’s 90 degrees outside, it’s darn difficult to get motivated to slave over a stove. I mean, really, that’s just about the worst thing I can think of. (Now, if you’ve got awesome air conditioning and your kitchen feels like winter, you might feel differently.) For those of us who cringe at the thought of sweating over a hot stove after sweating at the park with the kiddos all afternoon, this recipe is a lifesaver. Bake chicken 1 ½ hours at 300 degrees. Season with salt, pepper, and seasoned salt. 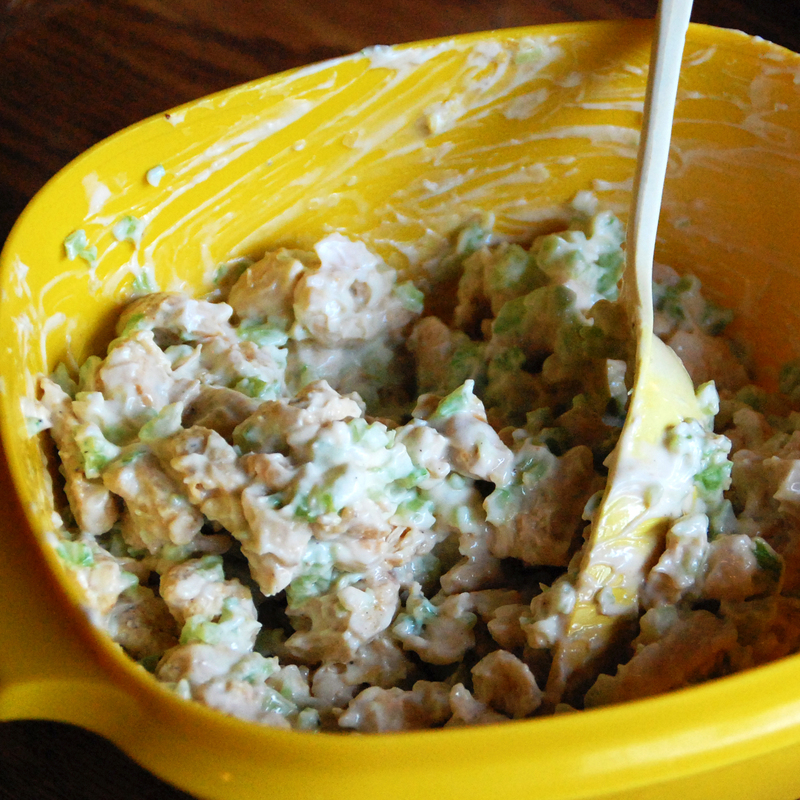 Do you have a favorite “keep cool” summer dinner recipe? Share it in the comments! Because of our love for all things burgers and grilling, we’re constantly on the lookout for more ways to indulge in this seemingly all-American food choice. And hey, if we can do it semi-healthfully, we will! 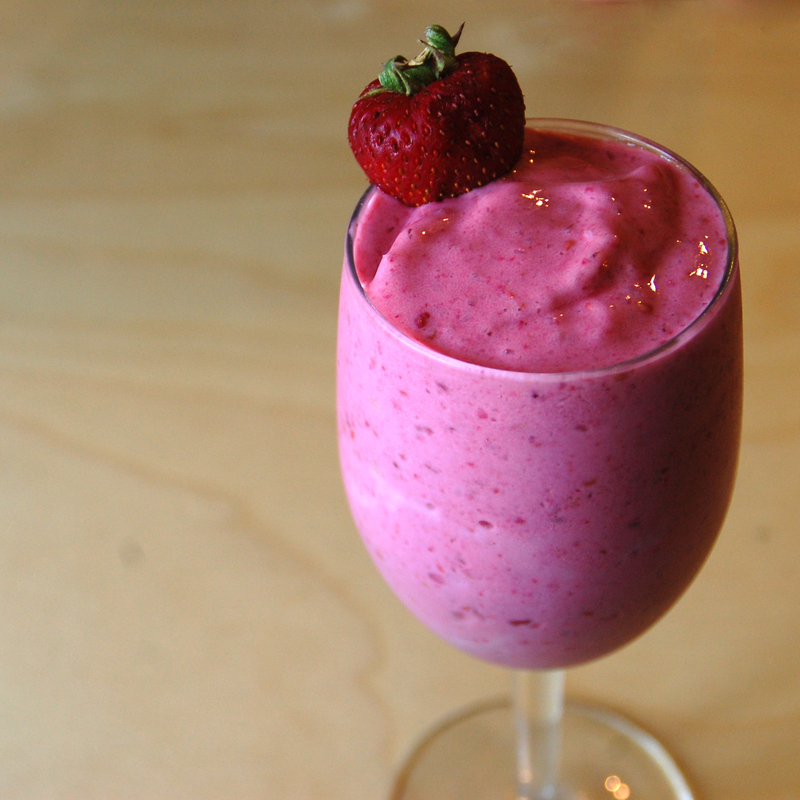 Here’s a recipe that never fails to satisfy AND encourage a healthy lifestyle. In a medium bowl, combine beef, scallions, teriyaki sauce, ginger, and garlic until thoroughly mixed. Form four equal sized patties. Lightly coat burgers, pineapple, and onion with cooking spray, place on grill. Grill every thing until done. Pineapple and onion should have golden edges, burgers to your liking. 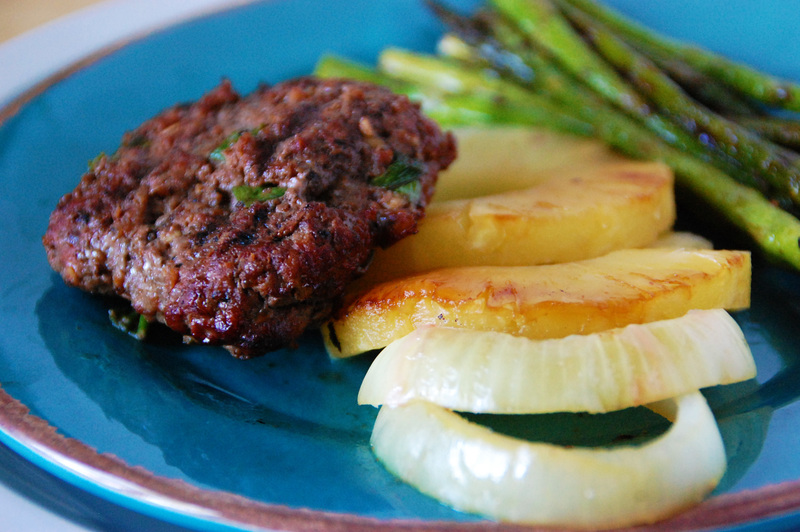 Serve burger naked with pineapple and onions. Do you have a favorite burger recipe? Share it in the comments! So what to do when your box of Bisquik is almost out, but the family wants pancakes? Make your own Bisquik mix with just a few simple ingredients. Recipe borrowed from The Food Network. Mix together ingredients, put into a jar/tupperware container. For each 1 cup pancake mix, add 1 egg, 1 cup milk, and 1 tablespoon melted butter. Do not overmix. Heat a flat griddle or pan over medium-high heat. Spoon batter onto the hot griddle and when bubbles appear on the surface of the pancakes, flip them over to make them golden brown on both sides. Now, of course you could top those delicious homemade pancakes with simple butter and maple syrup. The family would be happy, and heck, it’s easy, right? 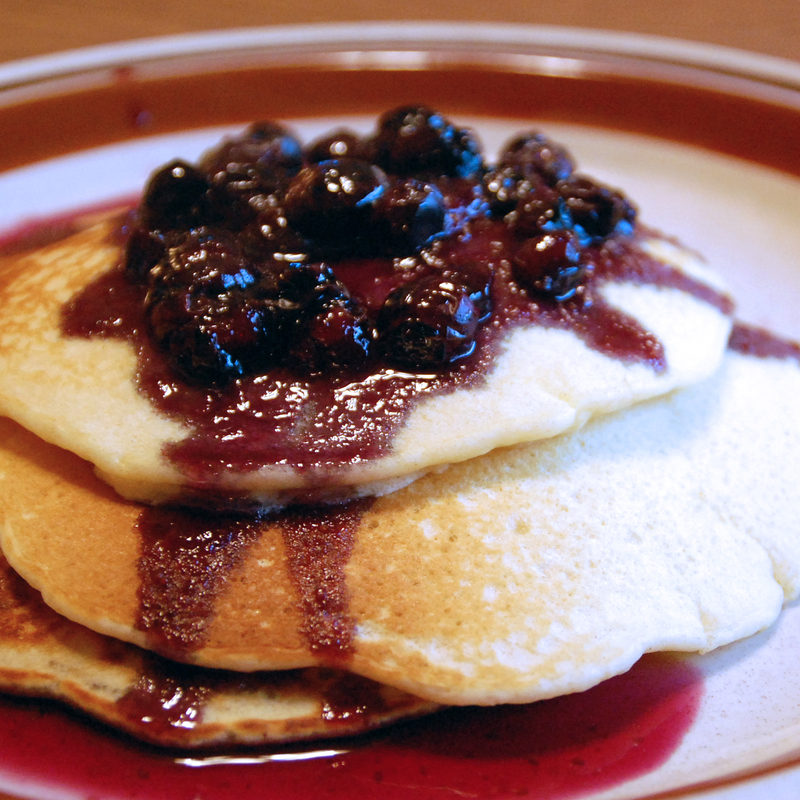 But… if you’re feeling creative, (or maybe you’re just in need of a “Wow, honey, these are amazing” compliment), you could make some blueberry syrup. And don’t worry- it’s only a teensy bit more labor intensive than regular syrup. Remove from heat, put in a pouring container for use on pancakes. Do you have a favorite homemade version of a classic breakfast? Share it in the comments! Summertime is here, and I’m pregnant. I’m not just a little pregnant. I’m a lot pregnant. Some of you might not know what this means- how can you be “a lot” pregnant? Well, my dear friend, I’ll tell you. “A lot pregnant”, in my professional opinion, is somewhere between “barely pregnant” and “so pregnant I could scream”. I’m officially 27 weeks into this pregnancy, which leaves me just 12-13 short weeks til little Abby makes her appearance. I use the term “little” very loosely here, as I happen to be one of those lucky women who produces large, chunky children. (In fact, when Aaron was born, the first words out of the doctor’s mouth as he held my brand new, 9 pound 3 ounce son were, “He’s a chunk!” Oh, what a memory. Thanks, doc.) So anyway, Abby weighs somewhere between 2 and 3 pounds at the moment, and I think I can safely say she’s going to kick-boxer. She’s active, and she loves to play games with the nerves in my back. Oh joy! Also, in case you’re wondering, I’m measuring in at about 30 weeks, (the distance from the top of my belly to the bottom of it), so you can imagine the increasing level of my general discomfort. And don’t even get me started on the effect summer heat has on women who are “a lot pregnant”. So why am I spending so many precious words to express my complaining-ness to you? Because I’ve found the solution. I’ll give you a hint: it’s pink, it’s served out of a wine glass (because I’m classy like that), and it tastes like heaven. No, there’s no alcohol involved, but it is intoxicating nonetheless. Do you have a favorite summertime dessert? Share it in the comments! Nay, allow the culinary genius in you to thrive- without working too hard. 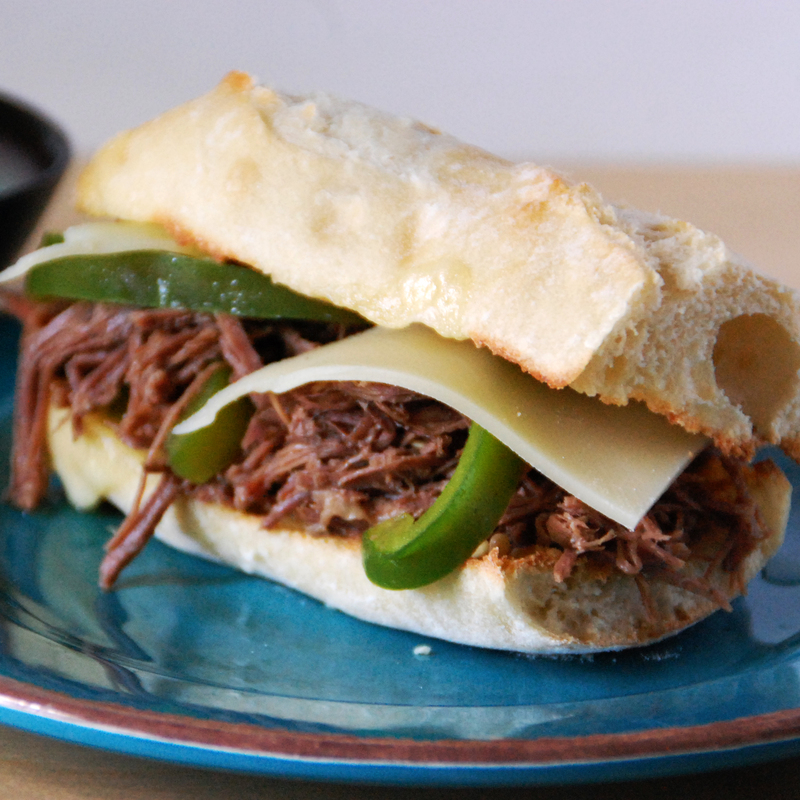 This Italian beef sandwich is hot, juicy, and the perfect combination of flavors: peppery meat, sweet crunchy peppers, smooth swiss cheese, and lightly toasted french bread to soak it all up. And the best part? It cooks in the crock pot! Trim fat from meat, brown in a frying pan with oil. While meat browns, put all ingredients (except bread and bell peppers) into the crock pot. 15 minutes before you sit down to eat, remove seeds and cores from peppers, slice thinly. Add to the crock pot. Set the oven to broil on high. Slice french bread into desired sandwich size pieces, top each half (on the bread side) with swiss cheese, arrange on a cookie sheet. Toast bread in the oven for 5-8 minutes, or until bread is golden and cheese is melted. Do you have a favorite hot sandwich recipe? Share it in the comments! Summer is all about brightness. Bright sunshine, bright colors, bright smiles… bright flavors! And is there any brighter flavor than lemon? I think not. Recently, I made a chicken picatta recipe, which rocked. I mean, it blew my mind. So I thought, “hey, this lemon/artichoke thing has to work with other proteins, right?” And indeed it does! I’m still working out the possibilities, but the first match I’ve found is tilapia- a buttery, flaky fish that is gentle on the fishiness and heavy on the good stuff. If you’ve never had it- it’s time to try. Seriously, it’s wonderful. If you’ve had tilapia before- you’ll love this recipe. Guaranteed. Lay tilapia side-by-side in an oven-safe dish. 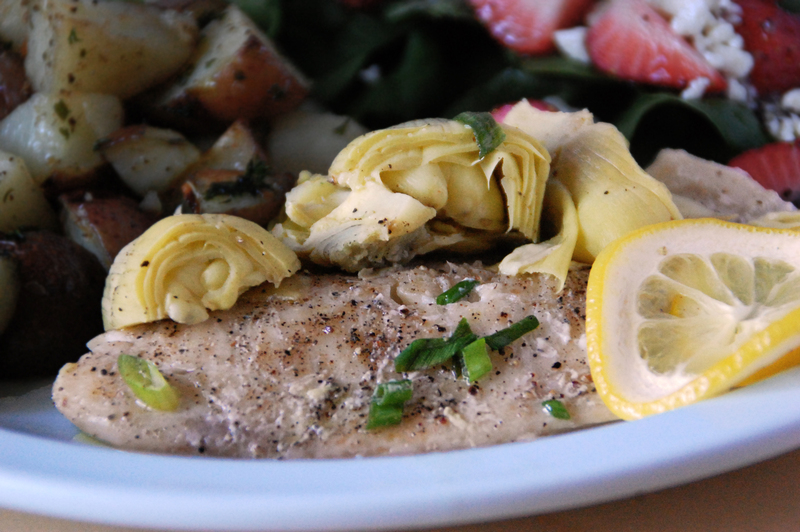 Cut artichoke hearts into manageable pieces, scatter over/around fish. Slice lemon thinly, scatter over/around fish. Baked for 18-20 minutes, or until fish flakes easily with a fork. Do you have a favorite tilapia dish? Share it in the comments.